This is actually starting to happen with some regularity now: Elderly Jews and others who want to get in on the Holocaust racket are inventing truly ridiculous stories and are being caught in their lies. 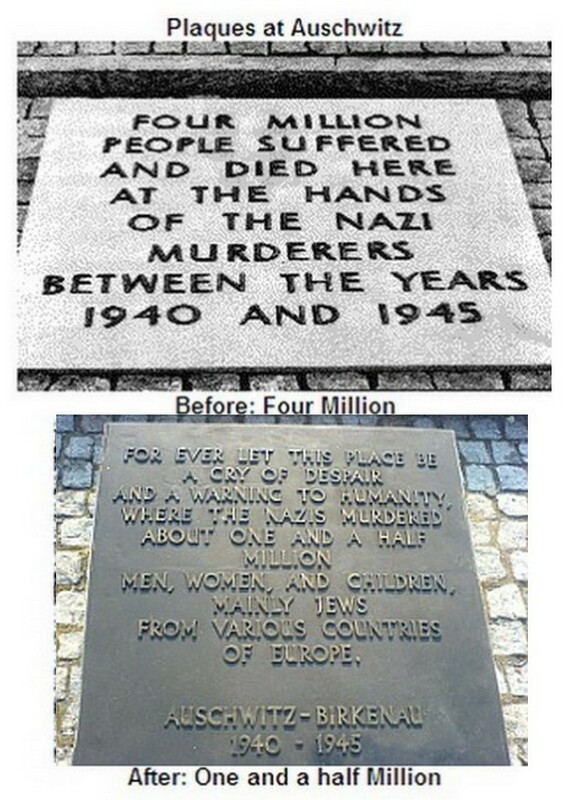 Changing plaques at Auschwitz suggest a radical decrease in the claimed number of Holocaust victims. Ironically, attempts to document the Holocaust by getting survivor testimony before they die may be backfiring. A considerable number of Jews have actually given accurate accounts of daily life in Auschwitz or Dachau or Treblinka, which bear no resemblance to the mythical claims of exterminations. Are all those Jews anti-Semitic or guilty of Historical Revisionism and defaming the dead? Their stories sound very similar to the stories of Japanese, who were locked up in the US in concentration camps like Manzanar by the FDR regime. Franklin Delano Roosevelt began the first wholesale imprisonment of enemy aliens by race during World War Two. Hitler began locking up Jews by race in retaliation only after Roosevelt locked up Japanese and first generation Italians and Germans. That part of history however is extremely “inconvenient” for the Allies, and is almost always swept under the rug. By 1945, the original reason for going to war, “saving Poland” was no longer relevant because Churchill and Roosevelt had sold out Poland to Communist occupation and slavery. A new reason to justify the war had to be invented so the Allies “discovered” at Nuremberg in 1946 that the concentration camps full of Jews “were really extermination camps” and the Holocaust story was born. That all sounds about as fair as the Treaty of Versailles. Someone should tell the French government that an unjust peace can come back to bite them. While the testimony of honest Jews, who describe the routine happenings in the concentration camps wasn’t exactly what the pro-Holocaust side wanted, they can’t be too happy with the lunatic ramblings of some alleged Holocaust survivors, who are obviously angling for a Hollywood screenplay or book deal. This woman told pathological lies about her past and should probably have been institutionalized, and yet because she claimed to be Jewish and her fantasies (that never happened) supported the Holocaust, she was believed without question and she has now produced a movie, that will no doubt be played to future gullible generations, some of whom will think it’s true. Why are stories like these being accepted so quickly and embraced so fully? Maybe no one in France was willing to say out loud what a load of BS this woman’s story was for fear of being prosecuted under their Holocaust protection laws. I tend to celebrate whenever a story like this is passed off as Holocaust lore because it is so far-fetched, it can’t help but wake up intelligent people to be skeptical of the Holocaust.